If you remember my post on Bentolicious #141 then you will remember that I mentioned before about The AppStore Bento Challenge at Mils' Blog - Not A Brown Bag. So I chose 'Cut the Rope' game from AppStore that my kids and I love to play on my iPad. Andrew is very good with this game. He always taught me on how to win this game whenever I failed to cut the rope and couldn't deliver the candy to the green little monster called Om Nom. This game is very popular in AppStore. It sold out 1 million copies in ten days. I used colored egg sheet to create 1st Part - Cardboard Box - Level 1 (as shown below from the screen shoot) . Inside the other box : fried chicken, macaroni risoles, carrot & daikon salad, (mayonnaise in separate container not shown) and cherry tomato. I linked this bento to What's For Lunch every Wednesday at Shannon's Blog. Please link yours too so you can have fun sharing your bento and see others too. Wow! What a fantastic job!!!! The colors are so fresh and bright, I love it!! I almost forgot about BentoMyApp, Beautiful submission!! The green monster is sooooooo kawaii!!!! I am totally addicted to this game! Even my kids love it, including my 2.5 year old, who plays it like a master. I will have to attempt this bento one day. But I'm glad I don't have an iphone. I don't need more things to get addicted to. Wow, he looks exactly right! Hope he gets this candy before he gets eaten today! 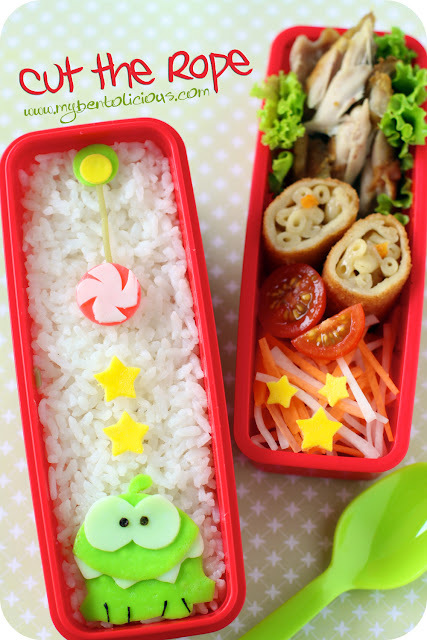 So cute and fun bento! sooo cute!!! Looks exactly like the app game!! by the way, what is macaroni risoles? it looks really interesting! Wow, so amazing! It looks just like the App. Wish I had an iPhone, the game looks so cute too! @Mrs. P : Thanks a lot Mrs. P! Risoles is very popular in Indonesia. Almost similar to croquette which wrapped in Risoles skin, filled and deep-fried. The filling can be modified to various thing like smoke beef, ragout, macaroni & carrot, cheese-ham-egg, etc. It looks exactly like the frog in the game.. so cute! It's great! I've discovered this game a few days ago and it's sooo nice to play! Your Bento is perfect, I love it! Lia, that will be a great task for me.. as I seldom play games, we have i phones but did not really explore the App stores.. haha..
ok, will try to join in the fun! OMG, this is so great! My kids will surely love it, they are a big fan of this apps. @NoveiMC : Thanks a lot! I love the Om Nom's sound, it's cute ;) Hope you can join the fun to make game bento too! @shoppingmum : Thanks a lot Amy! Your kids play this game too? Awesome! I'm yet to get myself an iPhone, maybe I should one day. Fantastic!! I've said this many times but your artistry and creativity just amaze me, Lia! Another adorable masterpiece!! Beautiful bento as usual...!! I just passed you an award, please feel free to pick it up if you want:). Thanks Lia for the Risoles info. I went and looked it up on google and boy do they look delicious! Looks like alot of work, but I might have to try this one day! aaaw... cut the rope! if i had this bento for lunch... err... i'll not eat it! too cute! This is so cute!would've been fun to have a bento making mum like u lol I live in jkt and I don't think I've seen better bento than this.I hv to learn how to!